Got something to say... later? At first glance Birdhouse might seem pointless. If you thought Twitter was vague, indulgent and pointless, look away now; Birdhouse is a notepad designed to let you draft multiple notes for Twitter and publish them when you choose. Frankly, we think the idea has some merit; you may not always want to publish immediately, you may want to check some facts or even just some spellings, or you might just want to organise thoughts for multiple accounts. Besides, if you think it's pointless, don't buy it. As it stands, it's a beautifully polished app that performs its stated function well. 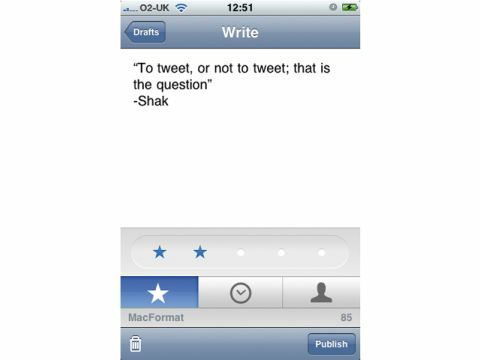 You can rate drafts and even unpublish notes that were added from Birdhouse.